We're a webdesign agency with numerous simultaneous projects, and a lot of people working on different projects. We already have an online PM-system which works fairly well, but we'd like a physical board to represent the current status. Is there any specific technique/structure I should use in this case? Below is a description of what data we'd like to have projected. Who is project manager for a given project? Who is currently working on a given project? When is a project due? How far are we with a given project? What is the upcoming projects for a given person? 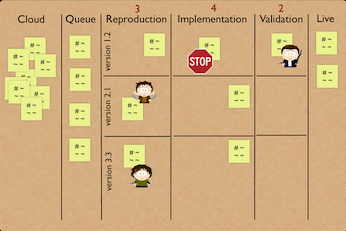 A yellow note represent a project and an avatar shows who or which team is working on that project. If you need a more detailed view (e.g. for different teams, versions, organizations etc. ), you can use swim lanes as they are shown on the board above. We had a company board just like this in the kitchen. The purpose of this board is to give a high level overview on the whole flow from the company's perspective. If we needed more information about a certain project, we visited the board of the team which was working on that project. Assuming that most of your staff are co-located then a high level physical overview of your current projects could be useful - it helps people understand current resource constraints and might protect those who are approaching deadlines from unnecessary interruptions. I wouldn't want to invest too much time in it though - some people will never use it and those who aren't in the office will just call up and ask anyway so you could be duplicating work. Anything more than that seems like overkill to me - keep the detailed stuff in your online system. If you make it too complex people won't (in my experience) use it. So... The project manager for a Project is indicated by the color on the note. Upcoming projects are to the left of the person responsible of "making the next move" in the project. When the project is ongoing, it is placed with the responsible person and relative to its due date as indicated above. Please let me know what you think. Any suggestions to improve this? 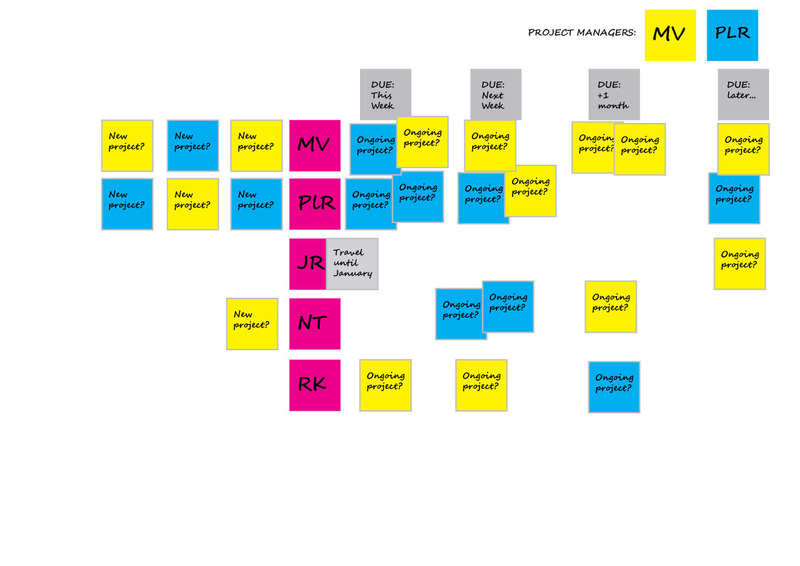 What we like a lot, is that it is easy to spot how many and which project a given person has at some point (if planning was good, the notes will be nicely spread out - if not so good they'll pile up and you won't be able to see all details -> very metaphorical). Further than that, the ability to adjust deadlines, responsible person and starting the project by just moving the notes around. Seems like that makes it easy to "play" and a very visual way of communicating changes in planning. Not the answer you're looking for? Browse other questions tagged multi-projects or ask your own question. What's a project management methodology suitable for a small team that addresses both operations and rapid-fire small projects?